This weekend I was back in my hometown of Vernon in the Okanagan to attend a friend’s wedding and had the chance to see what has changed since I left. 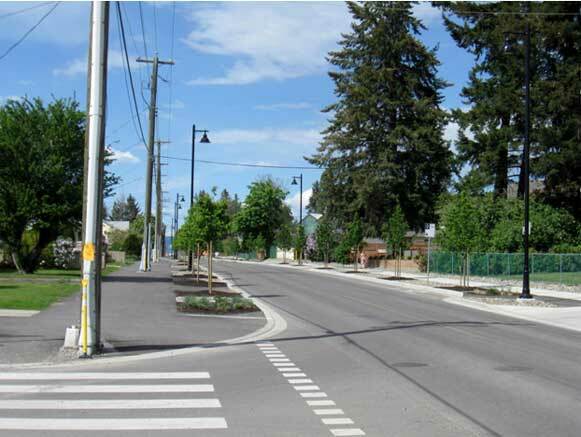 Back in 2008 the City of Vernon adopted an official community plan called “Plan Vernon” that was based on smart growth principals and was developed with the help of the late Smart Growth BC. One of the components of the plan was to increase transportation choice. For a fairly compact city of about 38,000 people, two of the major focus points are cycling and walking. One of the first things that I noticed was the amount of on-street bike lanes. As late as 2001, there were no bike lanes in Vernon and today it seems like every major street has painted on bike lanes and “Share the Road” signs. Also, the City of Vernon has constructed the 25th Avenue - Okanagan Landing Road west/east multi-use greenway and is in the middle of a multi-year plan to build the north/south Polson multi-use greenway. This will serve as the spin for Vernon’s sustainable transportation system. Even other roads in Vernon are getting the multi-use treatment. It is truly encouraging to see that communities beside Vancouver and Victoria are embracing alternative modes of transportation. It gives me hope for place like the City of Langley and South of Fraser in general can do the same. One of things that frustrates me about the City of Langley is the snail’s pace development of greenways, cycling, and walking facilities. While I commend the City for installing sidewalks and bike lanes for all new major projects, the majority of the City will remain untouched for many years into the future leaving a patchwork of cycling and walking infrastructure. If a small interior city can use its casino revenue to build a greenway spine for their cycling and walking network, surely a small city like Langley in Metro Vancouver can accomplish the same thing. I don’t expect every road in Langley to become multi-modal overnight, but funding one north/south and one east/west greenway would sure go a long way to providing a safe and appealing route for cyclist and pedestrians. It would also signal that the City of Langley is serious about sustainability and providing people transportation choice.